Caramel Bacon Pull Apart Bread. The ULTIMATE pull apart bread recipe! 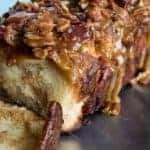 Soft cinnamon bread topped with a rich, thick bacon pecan caramel. This was DEVOURED! In small mixing bowl beat together the butter, milk, water, eggs, and vanilla extract. In large mixing bowl combine the flour, sugar, salt and instant yeast. Add the wet ingredients. Using dough hook attachment on mixer, or hands, knead the mixture until a soft, smooth dough forms. Place the dough into a lightly greased bowl, cover, and allow to set in a warm place for about an hour, or until doubled in size. Gently press into the dough to deflate it, and transfer the dough to a lightly greased surface (I sprayed my counter with baking spray) roll the dough out to about a 12″ by 20″ rectangle shape. In a small bowl combine the brown sugar, cinnamon, and chopped bacon for the filling. Spread the melted butter over the dough. Then sprinkle the filling mixture on top. Covering the entire rectangle of dough. Cut the dough crosswise into 6 equal strips, about 3.5″ by 12″. Carefully stack the strips on top of each other. Then cut the stack into 6 more equal pieces, about 2″x 3.5″ each. Grease a 9×5 loaf pan, and then turning the stacks of dough on edge, place them into the loaf pan, one behind the other, filling the loaf pan, squeeze them in there! Cover the pan with foil, and allow the loaf to rise again for another 60 minutes. Preheat the oven to 350 degree. Bake covered for 30 minutes. Then remove the foil and continue baking for an additional 10-15 minutes, until the top is golden brown and a toothpick inserted into the middle comes out clean, with no dough. Allow to cool in pan for about 20 minutes before removing from pan to a wire rack. In a small saucepan combine the brown sugar, butter, and corn syrup. Cook over medium heat while stirring. Cook until all sugar is dissolved and the mixture is bubbling. Remove from heat, add in the chopped bacon and pecans. Stir to combine. Then spoon over loaf of bread. Allow the topping to cool prior to eating! Serve and enjoy! Store sealed (I wrapped mine in foil) at room temperature for 2-3 days. Recipe adapted from King Arthur Flours Cinnamon Apple Pull Apart Bread Recipe. [br][br]*Prep Time includes time to allow dough to rise. [br][br]*Warm water and milk need to be at temperatures of 120-130 degrees, hotter than 130 degrees can kill the yeast.